Breakfast is the most important meal of the day. 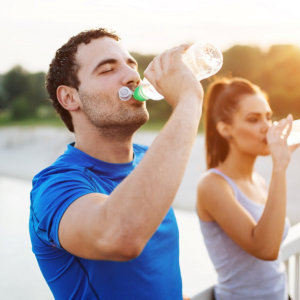 It must never be skipped as it makes the body metabolism take place in a routine manner. 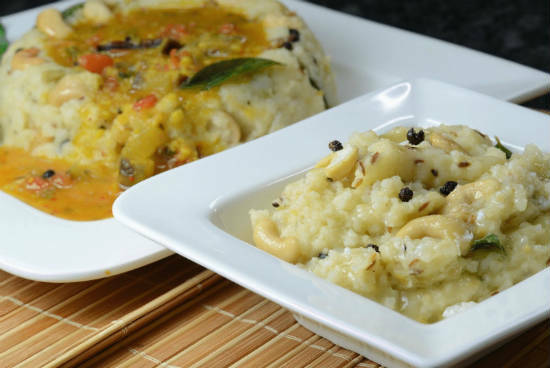 Why not try some delicious South Indian recipes for breakfast? Bring changes to your cooking style in this New Year and surprise your family members. There is nothing tough in making these South Indian delicacies. Utilize the existing groceries in your pantry and get going in style. 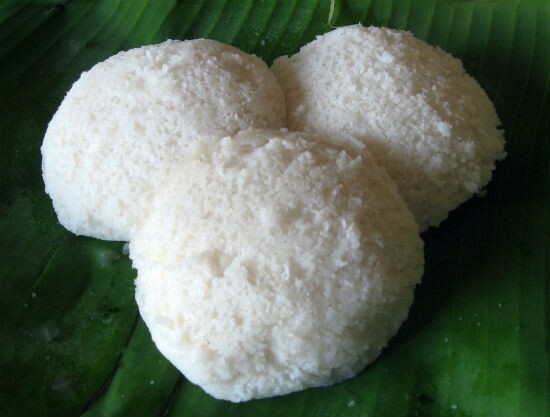 Idli: These classic Steamed Rice cakes are a traditional breakfast in many South Indian households. Black fermented de-husked lentils and fermented rice is used to make the batter and put in idli making containers to steam for some time. Fermentation makes the idlis easily digestible. These are served hot with sambar or chutney. Rava Idly is made using rava (sooji). Add mustard seeds in a pan having hot ghee and add curry leaves, green chillis, ginger and coriander leaves. Add sooji and mix well adding salt, lemon juice and eno powder. Make a thick batter and add curd to make a nice consistency. Put in idly maker and steam to obtain nice rava idli. Garnish with a cashew on top. 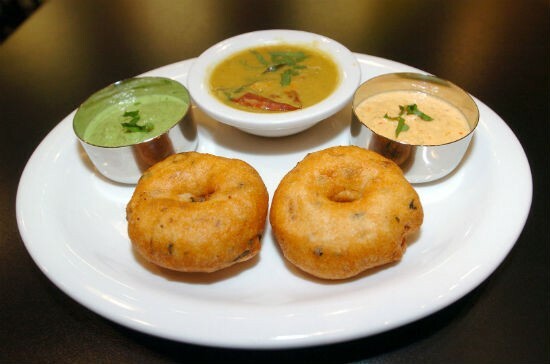 Medu Vada: Another wonderful breakfast item made from soaked urad dal. Overnight soaked urad dal is ground to make a batter.Add crushed black pepper, cumin seeds, Asafoetida powder, curry leaves, salt and baking powder in the batter and fry in hot vegetable oil till brown. Serve with chutney in hot condition. 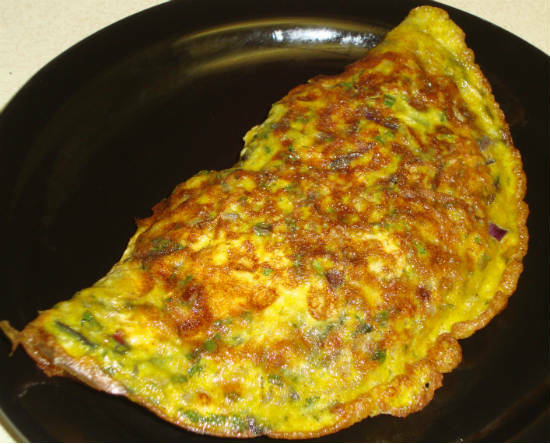 Masala Omelette: Omelette is very easy to make and breakfast feels incomplete without eggs. Take 2 eggs in a bowl and add chilli powder, green chilli pieces, onion pieces, tomato pieces, coriander leaves, salt and grated cheese. Beat the mixture well and put in a pan with a little oil. Turn it around when one side is done. Serve hot with some grated cheese on top. 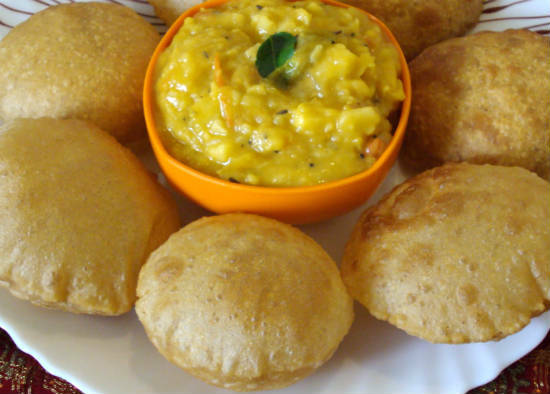 Poori and Potato Sabji: Poori is made with wheat flour and little sooji dough with salt to taste. After making the dough the puffed bread is prepared with a rolling pin. Small two to three inch sized circles of flattened dough are put in hot oil. They puff up like pooris and look great. Serve the pooris hot with potato sabji. Sabji is made using curry leaves and mustard seeds in oil followed by adding potato cubes, turmeric powder, salt, sugar, and tomato cubes. This complete dish makes the family feel great at the start of the day. 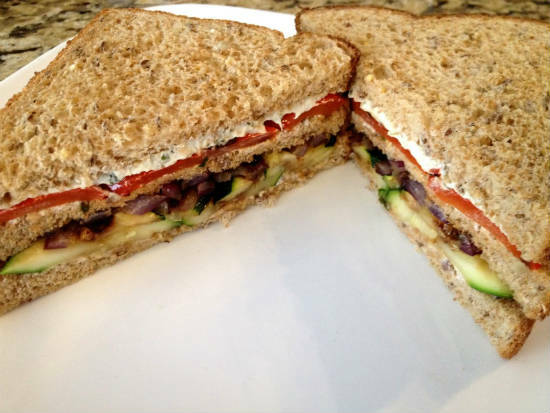 Vegetable Sandwich: Sandwiches are very easy to prepare using white or brown bread slices. Prepare the filling with oil in a pan followed by adding onions, green chillis, mashed potato, boiled peas, boiled carrots and beans. Cook it well with salt and pepper and make it a mash. Put the filling in between two toasted bread slices and serve with tomato ketchup. It is wonderful to eat and children will dig in almost immediately. Pongal: Ven Pongal, a combination of rice and dal with spices, is a famous south Indian breakfast. Roast the rice and moong dal in the pan and keep aside. Take a pressure cooker and put water in it along with cumin seeds and salt. Add the roasted dal and rice and cook till these are cooked well. Mash the mixture well and keep aside. Take ghee in a pan and add mustard seeds, curry leaves, cashew nuts and ginger julienne. Put the mashed rice and dal mix and prepare thoroughly. Serve hot with a dollop of ghee on top. 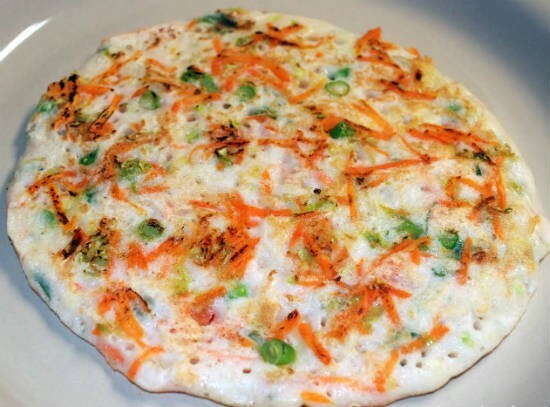 Dosa: Dosa has many forms and people like to bring variations to dosa preparation according to their tastes. Soak green moong with rice in water for a whole night. Prepare a mixture by grinding in blender and make dosas in nonstick pan by pouring a little of the mix in the pan and spreading in thin layers. A Little bit of oil can be added from sides to keep it crispy. This is a green gram dosa. Plain dosa requires soaking of urad dal and rice overnight for the batter. 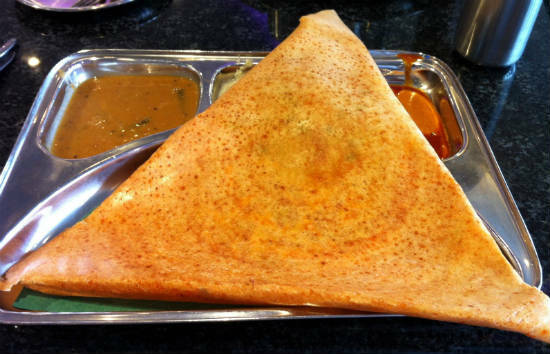 Masala dosa is like plain dosa but it contains filling. The filling can be prepared with mashed potato, onion pieces, ginger pieces, cut coriander leaves and chili. Salt must be added to the filling and the filling is put in the center of the dosa. Wrap the dosa and serve hot with coconut chutney. Cone dosa is another form of plain dosa served in cone form in many restaurants in South India. 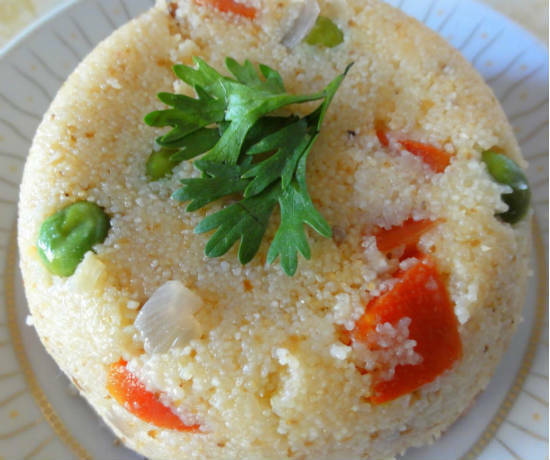 Rava Upma: Take oil in a pan and add mustard seeds and curry leaves. Put chopped onion, ginger, boiled potato cubes, boiled carrot cubes, peas and corn in the oil and cook well. Add salt and sugar along with cashew nuts and rava. Put water and let it cook for 2 to 4 minutes. Serve hot with sprinkle of roasted almonds on top. 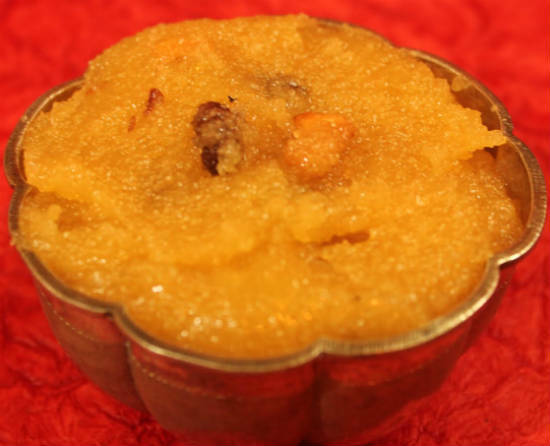 Rava Kesari: Stunning South Indian sweet served at breakfast time during festive occasions. Sooji or rava is roasted till brown in ghee in hot pan and kept aside. Cashews are roasted in the pan containing ghee and kept aside along with raisins soaked in water. Then take the rava in the pan and add water, little bit of milk, Kesari powder and a pinch of salt. Bring it to boiling condition while adding sugar generously. Stir continuously to avoid lumps and lower the heat. Add ghee from the sides and allow the4 mixture come out of the pan in solid composition. Add the cashews and raisins on top with edible silver foil on top. Uttapam: Soak rice, methi seeds, chana daal and urad daal for a night and grind the mixture in a blender. Put the batter on a non stick pan and let it spread to about 3 inches in diameter. Pour little oil at the side to make it crisp. Put some chopped onion, tomato, chillis and coriander leaves on it and turn it upside down. Make slits to make the vapor arise and let the other side cook well. Serve hot with sambar and coconut chutney. 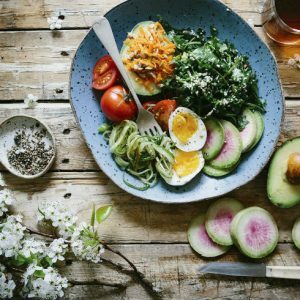 Start making these dishes at home and make variations according to your likes. Balanced meal at the beginning of the day makes everyone feel good and happy. Eggs are becoming popular among South Indian homes. Children love eggs and sandwiches and insist mothers to make some for them. Make a new item every day and get appreciation from your loved ones. 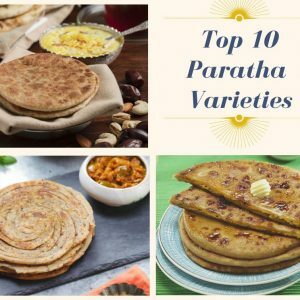 Feel free to comment or share your thoughts on this "Top 10 South Indian Breakfast Dishes" article from Awesome Cuisine.